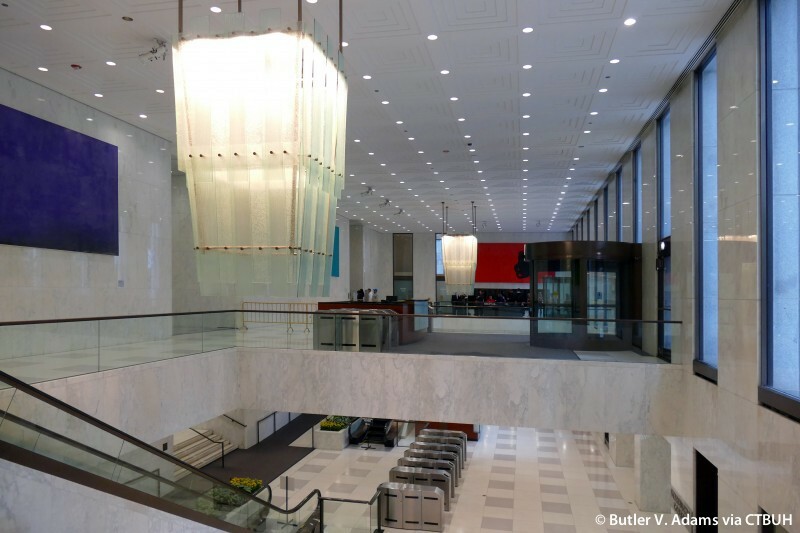 • Past	 Amoco Corporation;	Piedmont Office Realty Trust;	The Blackstone Group L.P.
• Design Cosentini Associates;	Economy Mechanical Industries, Inc. 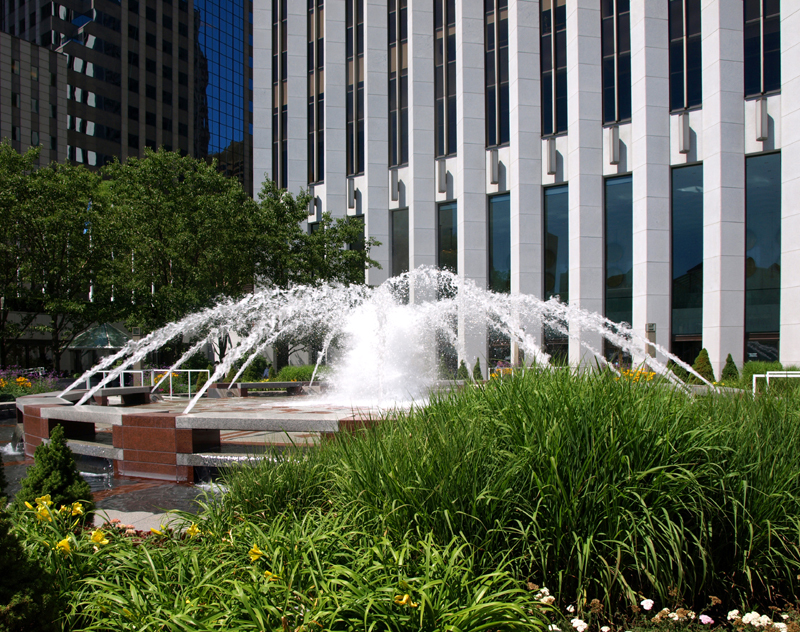 Located in downtown Chicago overlooking Millennium and Grant Parks on the eastern edge of the Loop. 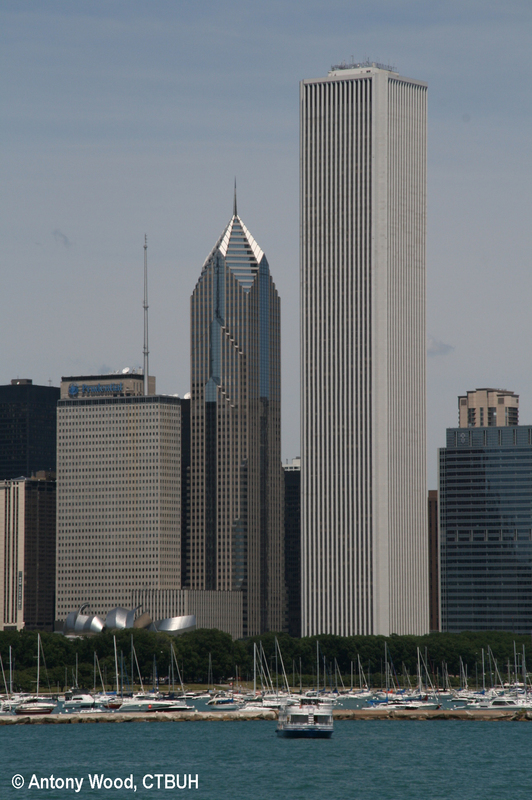 The Aon Center is one of the “string of pearl” buildings that stand-out on Chicago’s skyline for their remarkable height. 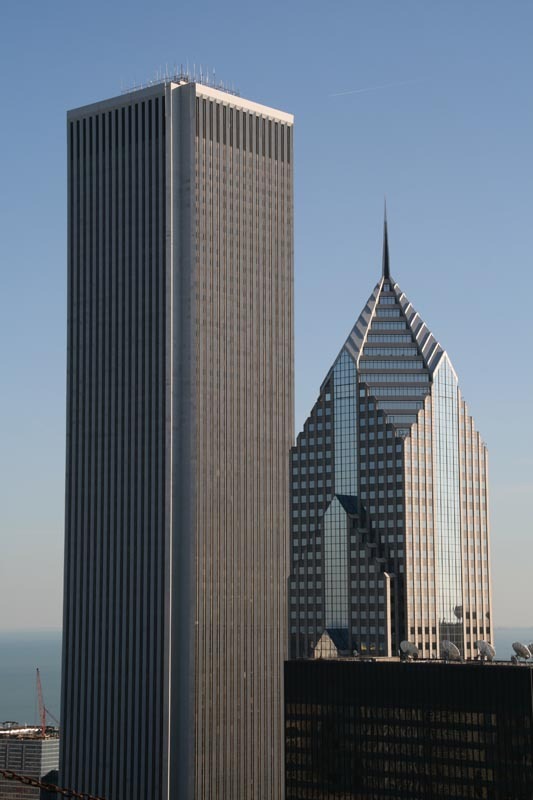 At the time of its completion, the building was only the sixth supertall tower ever constructed. 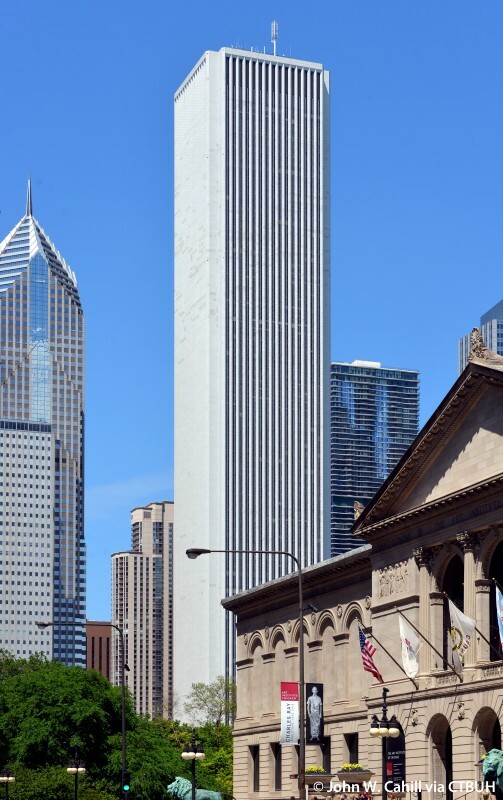 Originally clad in Carrara marble, it was the tallest marble-clad building in the world until it was reclad in white granite due to safety concerns in the early 1990s. 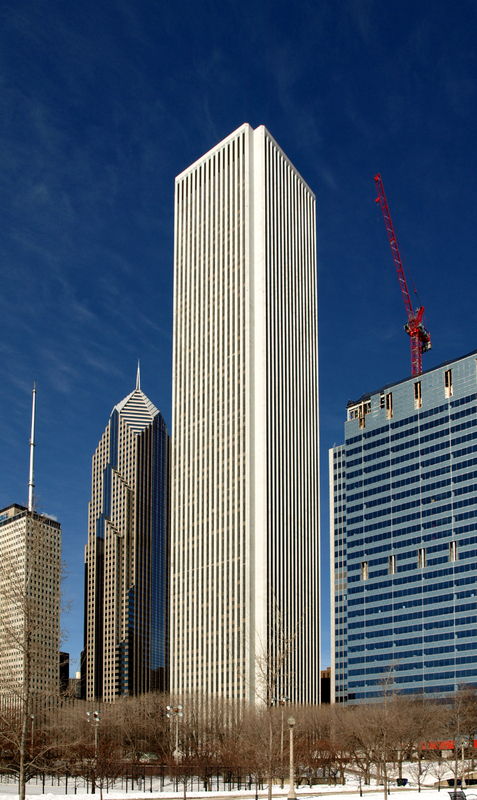 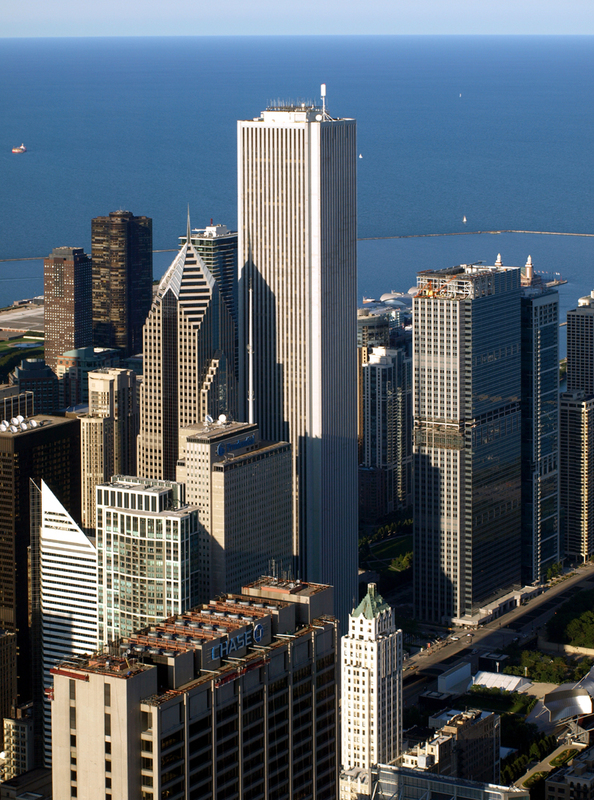 Simple in design, the Aon Center appears monolithic, without any setbacks or adornments. 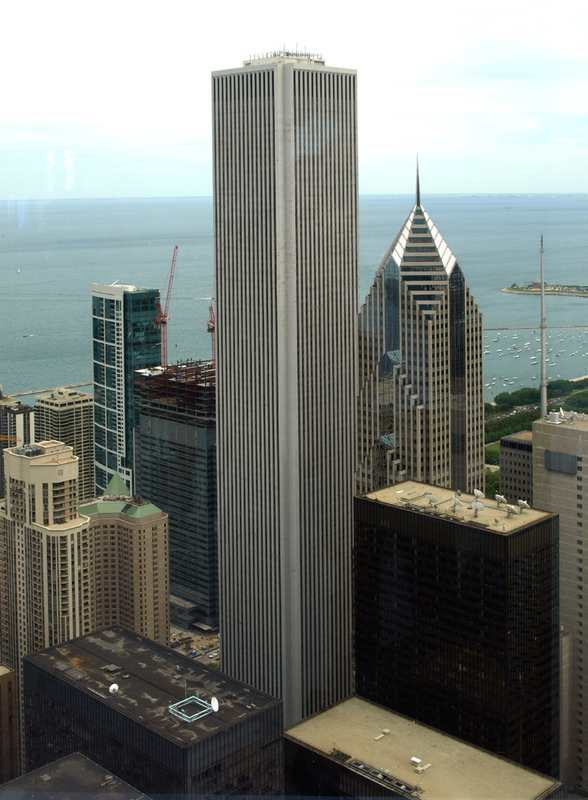 The building’s shape and scale are reminiscent of New York’s original World Trade Center buildings, its architectural contemporaries. 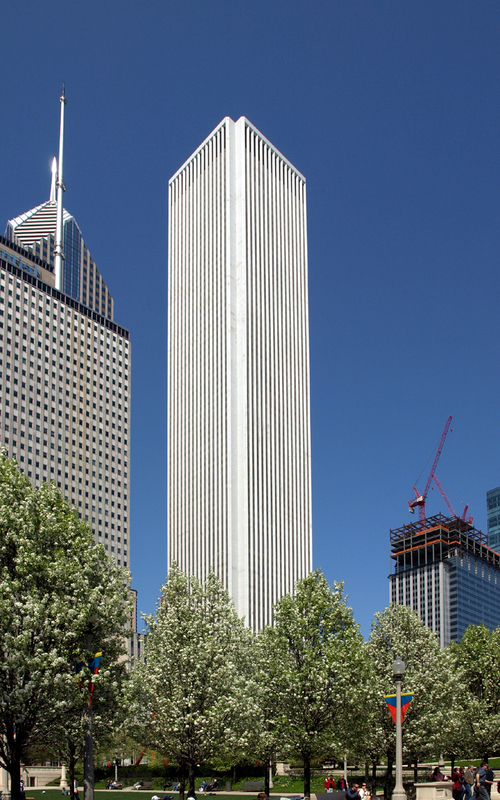 Similar to the World Trade Center towers, the Aon Center employs a tubular steel-framed structural system with “V”-shaped perimeter columns to resist earthquakes, reduce sway, minimize column bending, and maximize column-free space. 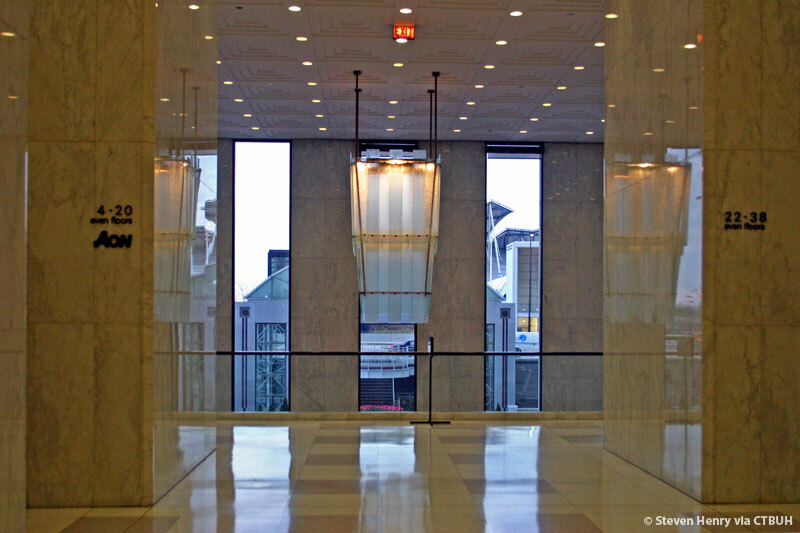 The columns also house piping and utility lines, eliminating the need for interior column chases that so often deprive buildings of valuable office space. 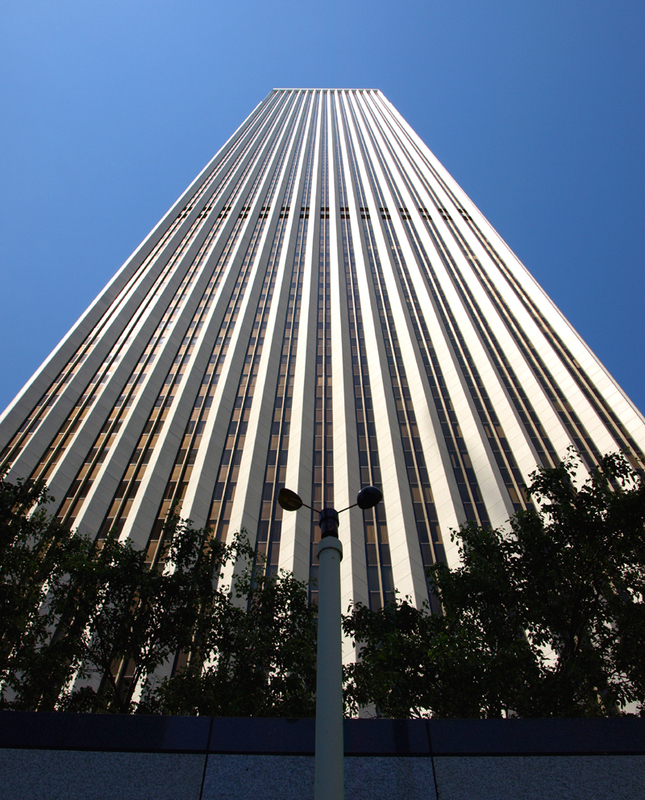 They also serve to emphasize the building’s height and augment its vertical prominence. 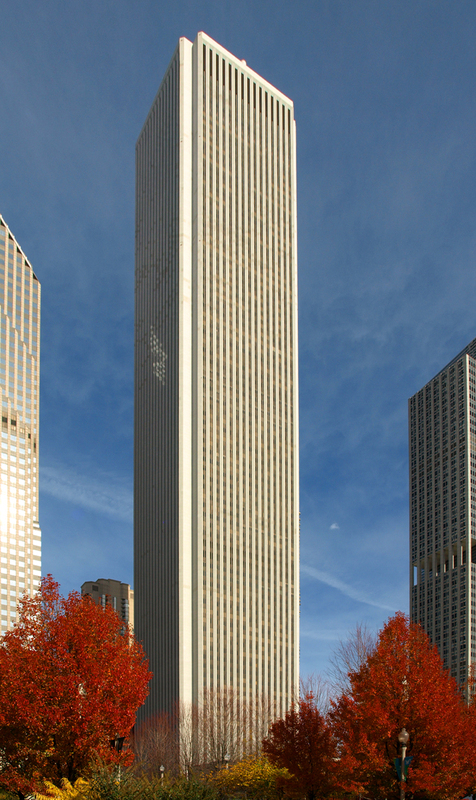 Despite the building’s imposing configuration, it is still well-integrated into its urban habitat. 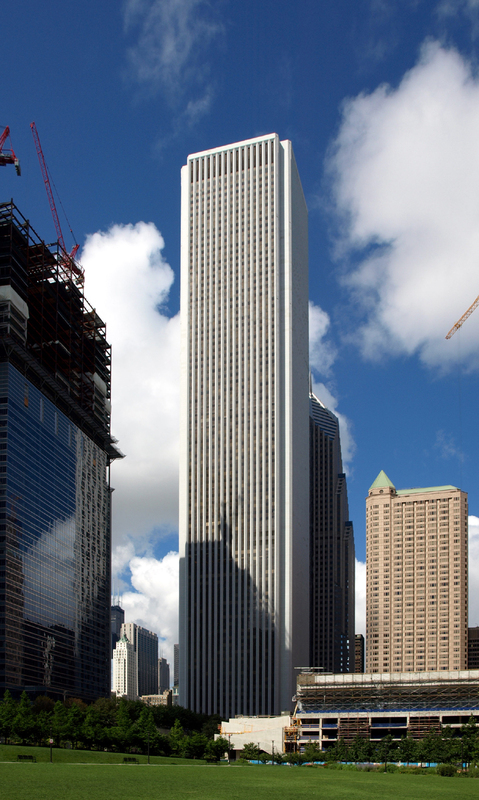 The Pedway, a series of underground pedestrian walkways, connects the Aon Center to numerous surrounding buildings throughout the loop. 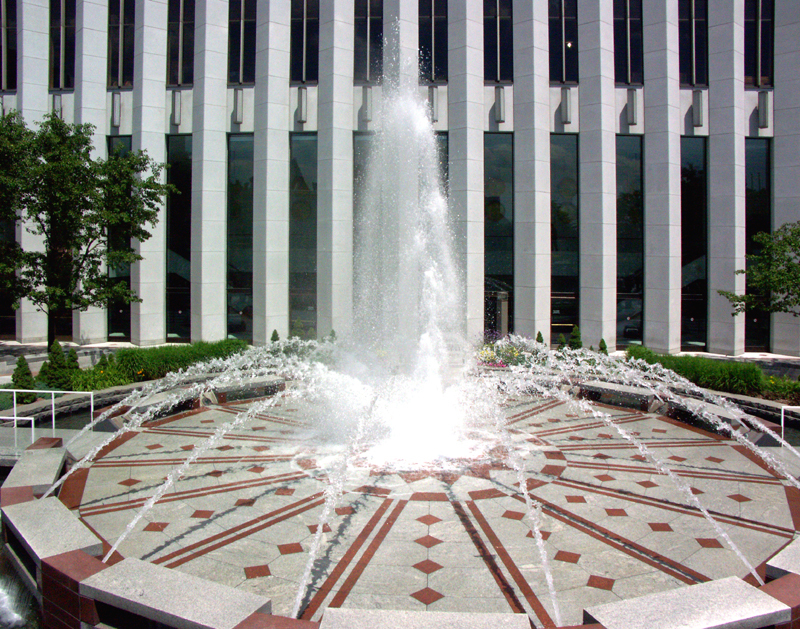 A plaza decorated with fountains and ample seating envelops the tower on all sides and provides an inviting place for pedestrians to congregate on a nice day. 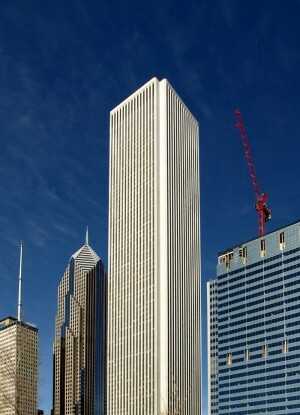 Taken together, the Aon Center’s quiet, dignified façade and its simplicity overall, make it a unique and memorable addition to the skyline.